My 18 month old’s behaviour recently went backwards. Basically he stopped being his happy, smiling and laughing self, and started having more and more meltdowns. Proudly sponsored by ACT Health as part of the Good Habits for Life initiative. For a month he pretty much rejected me. He cried more. Became frustrated easily. Began throwing his toys, and biting and hitting both me and his Dad. Plus, he had at least two complete meltdowns every day. The morning meltdown was usually triggered by his breakfast not being ready quick enough, or if he wanted to ride his ride-on train to child care (1.5kms away! ), or if I was taking too long getting ready for work. In the afternoon, his meltdown was triggered by basically anything – being bored with his toys, being hungry, not getting his dinner quick enough, not liking his dinner, not wanting to put his pajamas on. You name it – he would be upset over it. But what was truly most heartbreaking of all was that he didn’t want me to read him anymore. He would select a book walk straight past me and put it in Dad’s hands. I was devastated. I put it down to his age and the fact that I was the parent who did the practical components of running the household such as getting bub out of bed, feeding him brekky, getting him dressed, leaving the house, childcare drop off, and the afternoon pick up. In a nut shell, I was being busy but I wasn’t a ‘fun parent’. I just felt that my connection with my son was lost. So, I re-evaluated the parent I wanted to be. Firstly, I went to ACT Health’s Good Habits for Life website where they are running a campaign teaching parents the importance of role modelling and encouraging good habits in their children, including connecting with each other. It wasn’t long before I realised what I needed to do. I needed to be more engaged with my child. I needed to stop being ‘the busy parent’ – which is difficult to do. I needed to start involving my child in the activities I was doing and being more involved in what he was doing. Basically, I needed to reconnect with my family and back back into life again. As well as working, the two biggest activities I had to do each day that were non-negotiable, were the running of the household and exercising. This meant I somehow had to incorporate being an engaged, connected parent with these every day activities. We made a special effort of cleaning our teeth together. I safely sat him on the bathroom basin and we cleaned our teeth together by inarticulately singing random songs. Do you know how hard it is to sing while brushing your teeth? Then he showed me how beautiful he had made his teeth by giving me a big toothy smile. Instead of getting ready on my own and then getting him ready, we got ready together. He helped me open my dressing table drawers to get clothes out. He read me a book while I put my make up on. We put our shoes and socks on together, one sock for mummy, one sock for bubby, and so on. We put our jackets on together and it wasn’t long before he was climbing into his pram eager to start his day. Childcare was always quite traumatic for us. Since I’ve started my ‘get into life’ philosophy, I realised that all my son wanted was to be near me. So, we made walking to childcare fun. We pointed out trucks, diggers, cars and ducks along our way. We picked up autumn leaves and felt their texture before scrunching them into a billion pieces. We sang songs and talked about all the things we could see along the way. When we arrived, he helped me by carry his school bag into childcare so he could show it off to his little friends. Then we spent a few minutes together reading a book and settling him into his morning routine before I left for work. I realised that most week day afternoons were spent rushing around getting ready for school or dinner. So I left work 15 minutes earlier and we took our time walking home. Just as we did when we walked to school, we spent our walk home playing in the park, chasing naughty magpies and laying under the tree to watch the sky, clouds, leaves. This always felt like a hassle before bed, but once I reframed the negative to something positive, I realised this was the last opportunity at the end of a long busy day to spend time together. So, we made a game of putting his toys away. We put all the blue blocks away, then all the red blocks away… etc. We made a game of putting our clothes away where we put ‘bubbys’ clothes in his bedroom, then ‘mummy’s’ clothes in her bedroom (I then had to go and put them in their right place, but the point was, his helping and being a part of this activity meant he was ‘helping mummy’ and we were doing things together!). Being active with bub became easy and fun! We played hide and seek and I chased my son around the courtyard (aka cardio training for me). I wheeled him around the yard on his ride on train (resistance and cardio for me). I taught him to touch the sky and touch his toes (stretches for both of us). We bent down low and jumped up high (squats and tuck jumps). We played silly walking by stomping our feet, lunges, or walking with high knees (cardio). I am not sure why I have ever tried to cook dinner without my little one’s help. Where once he would sit on the kitchen floor crying or grabbing my hand to pull me away from the bench to play, he now helps pull the vegetables out of the fridge that we cooking that night and put them on the kitchen bench. I reinforce his education around fruit and vegetables when we go grocery shopping together and he gets to choose one fruit or vegetable he would like. He sits in his big boy seat and rides in the trolley. Now, rather than him picking everything off the shelf, I hand him a fruit or vegetable and ask him what it is – ‘this is a cucumber’, before he plonks it into the trolley. What a great little helper! Another activity that he did alone that I used to dread, was getting him to eat dinner. Before he would end in tears and more often than not, throw some mushed up vegetable across the room. But I have bought him a new wider spoon and longer fork so that he enjoys eating again, and we always eat dinner together. Plus, I creatively hid the vegetables that he didn’t really like into meals by grating or blending them in (see recipes). We can now eat dinner together and it be an enjoyable activity that we can actually do together. We don’t talk about what he’s eating or how much. Instead, we focus on what’s happened in the day and telling stories. Some nights we break the tradition of eating at the dinner table and eat on our laps on the balcony watching the world go by. Our little one loves to help. I realised I could make the regular job of washing and putting away clothes a joint activity. So, I lowered the bottom railings of the clothes horse and gave bub some items of clothing to hang up on his own while I hung out the larger items up top. Believe it or not, he loves it, and we spend more time doing jobs together. Vacuuming together – yes you can! Our little one was never scared of the vacuum cleaner, but he was always very curious about it. So I harnessed his curiosity and invited him to hold onto the hose while I pushed it around. This is now an hilarious activity we do together as the to-ing and fro-ing of me pushing the hose as he holds onto it has him in fits of giggles. On the days when I really just need to get the vacuum cleaning done in record time, I ask him to put all of his toys on the couch shortest to tallest so I can vacuum a toy-free zone. While I incorporated our ‘togetherness’ into all my tasks as much as I could, I also left other jobs until after he went to bed. Instead of doing the dishes and wasting valuable, limited time I had at home with him, I spent the time between dinner and bed playing with him and his choice of activity. This had previously been the peak meltdown moment, but with my engagement, we ended up playing happily together until bedtime. This now involves dancing to some music, building a block tower and then 30 minutes before bed, some wind down time with his choice of book/s. After incorporating more together time in our daily activities, our relationship has improved significantly. I am not exaggerating, it was phenomenal to see a once cranky, unsettled little boy, turn into a smiling and giggling little toddler again. He had less meltdowns and I was less stressed. He wanted to leave the house sooner to explore outdoors, and he settled into childcare easier. We laughed more and cried less. He spent less time throwing, biting and hitting, and more time playing with me. A secondary benefit that I didn’t even realise had occurred until later was that we suddenly appreciated our life a lot more. We did little things together, we found fun in otherwise very boring tasks, we bonded more without realising it, and quite simply, got back into life again. What tasks do you do with your children? How do you connect with your family? ACT Health runs a range of programs to support you and your children to set good habits for life, such as Fresh Tastes: healthy food at school and Ride or Walk to School. For more ideas on how to engage your little ones in every day activities, visit Good Habits for Life tips page. My kids (3.5 and almost 2) help me unpack the dishwasher and sort and put their clean clothes away. It takes AGES longer than if I did it my self but it’s fun and they’re learning that we all need to contribute to the running of the house. What a great post Lauren. So many great tips and I think can apply to kids of all ages. 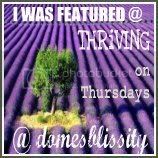 Thanks so much for linking up to Thriving on Thursdays linky party. I’ll be featuring this post at tomorrow’s party. Please come again. It is sooo hard to be in the moment and not be the “Busy mom.” I love these tips! 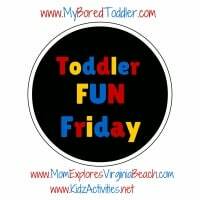 Thanks for sharing on #ToddlerFunFriday!